Announcing the availability of the TeeChart Pro ActiveX Control v2018.0.10.2 maintenance release. Announcing the availability of the TeeChart Pro ActiveX Control v2018.0.10.1 maintenance release. Announcing the availability of the TeeChart Pro ActiveX Control v2018.0.8.10 maintenance release. Announcing the availability of the TeeChart Pro ActiveX Control v2018.0.2.9 maintenance release. Announcing the availability of the TeeChart Pro ActiveX Control v2017.0.0.0 maintenance release. Announcing the availability of the TeeChart Pro ActiveX Control v2016.0.0.2 maintenance release. Announcing the availability of the TeeChart Pro ActiveX Control v2016.0.0.1 maintenance release. Announcing the availability of the TeeChart Pro ActiveX Control v2016.0.0.0 maintenance release. Announcing the availability of the TeeChart Pro ActiveX Control v2015.0.0.3 maintenance release. Announcing the availability of the TeeChart Pro ActiveX Control v2015.0.0.2 maintenance release. Announcing the availability of the TeeChart Pro ActiveX Control v2015.0.0.1 maintenance release. Steema would like to inform you about the availability of the TeeChart Pro ActiveX Control v2015.0.0.0 maintenance release. Steema would like to inform you about the availability of the TeeChart Pro ActiveX Control v2014.0.0.3 maintenance release. Steema would like to inform you about the availability of the TeeChart Pro ActiveX Control v2014.0.0.2 maintenance release. Steema would like to inform you about the availability of the TeeChart Pro ActiveX Control v2014.0.0.1 maintenance release. To celebrate the launch of TeeChart Pro ActiveX v2014 we are offering a 15% discount on developer licenses, license upgrades and renewals until 30 April 2014. Take advantage of this limited time offer and ORDER now ! Steema is please to inform you about the availability of the TeeChart Pro ActiveX Control v2013.0.1.4 maintenance release. Steema is pleased to announce the availability of the TeeChart Pro ActiveX Control v2013.0.1.3 maintenance release. Steema is pleased to announce the availability of the TeeChart Pro ActiveX v2013.0.1.1 maintenance release. Steema is pleased to announce the availability of the TeeChart Pro ActiveX v2013.0.1.0 update version. Steema is pleased to announce the availability of the TeeChart Pro ActiveX 2012.0.0.9 update version. The TeeChart Pro ActiveX 2012.0.0.8 update version has been made available to correct a display issue with double-byte languages in the Chart Editor. Steema is pleased to announce the availability of the TeeChart Pro ActiveX 2012.0.0.7 update version. Steema is pleased to announce the availability of the TeeChart Pro ActiveX 2012.0.0.6 interim update version. Steema is pleased to announce the availability of the TeeChart Pro ActiveX 2012.0.0.1 version. The TeeChart Charting Library offers 56 Chart styles and 38 mathematical functions and a full set of Chart tools components for additional functionality. 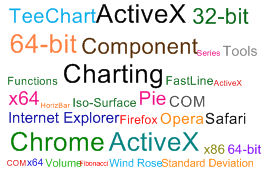 Steema is pleased to announce the availability of the TeeChart Pro ActiveX 64-bit BETA version. TeeChart Pro ActiveX v2011.0.0.5, latest maintenance release, now available. TeeChart Pro ActiveX v2011.0.0.4, latest maintenance release, now available. TeeChart Pro ActiveX v2010.0.0.3, latest maintenance release, now available. TeeChart Pro ActiveX v2010 release available! TeeChart Pro v2010 ActiveX BETA! Steema software is pleased to announce the availability of the TeeChart Pro v2010 ActiveX BETA. The new version brings GDI+ rendering and native unicode for all versions, plus many other exciting features. You can take a look at what's new here. To access the Beta trial download click here.